Cumberland Nursing Schools - Memorial & Sacred Heart. Cumberland's former hospitals, Memorial and Sacred Heart, both had training schools for nurses. Memorial and Sacred Heart Hospitals affiliated in 1996 to form the Western Maryland Health System. Below is a brief history of the two hospitals and the nursing programs. Memorial Hospital has its roots going back to 1888 with the establishment of the Western Maryland Home and Infirmary for the Aged. Facilities were initially located in private homes. In 1892 a new building was erected on Baltimore Avenue and dedicated as the Western Maryland Hospital. Western Maryland remained a hospital until the facilities were relocated and the name changed to Memorial Hospital which was dedicated on August 18, 1929. A nurses training school was established very early when the facility had still been known as the Western Maryland Hospital. It eventually became known as the Memorial Hospital School of Nursing. The hospital's school of nursing closed in 1972 with the transfer of the nursing curriculum to Allegany College of Maryland, which was then known as Allegany Community College. 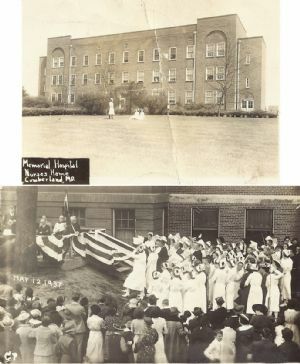 The postcard above depicts the Memorial Hospital Nurses Home, which was constructed next to the hospital in 1929 at a cost of about $75,000. Postmarked May 2, 1947, the back reads as follows: " Dear Brother Harry, Can't tell you much really as Johnny is in Memorial Hospital and is not much better, are giving him penicillin and he has best care. Will write more and let you know how he is progressing. Yours, Margie". With the merger of the two hospitals and closing of Memorial, the nurses home was remodeled as a medical building houses doctor's offices. Sacred Heart Hospital has its genesis with the 1905 founding of The Allegany Hospital on Decatur Street. In 1911 the Daughters of Charity took over the hospital's administration and within two years tripled the size of the facility. In 1936, the hospital began construction of a five-story annex. In 1952 the name was changed from Allegany to Sacred Heart Hospital. Because of a lack of space for expansion, plans were begun about 1957 for a new location. Groundbreaking ceremonies took place in 1964 for a new Sacred Heart Hospital to be located on Haystack Mountain. The "new" hospital was officially dedicated on June 11, 1967. With the affiliation of Memorial and Sacred Heart in 1996, the presence of the Daughters of Charity was eventually withdrawn in 2005. The postcard above depicts the May 12, 1937 dedication of the new Allegany Hospital annex on Decatur Street. Note the participation of the nurses. It is written that the Allegany Hospital Training School for nurses, later known as the Sacred Heart Hospital School of Nursing, was officially established in 1911. It operated under the direct supervision of the hospital superintendent and entailed three years of training in both nursing theory and hands-on practice. It should be noted that there is a 1908 reference to a "first class" of nursing graduates from Allegany Hospital which consisted of two people. Regardless, by 1918 there were five graduates, and by 1923 the graduating class consisted of ten nurses.